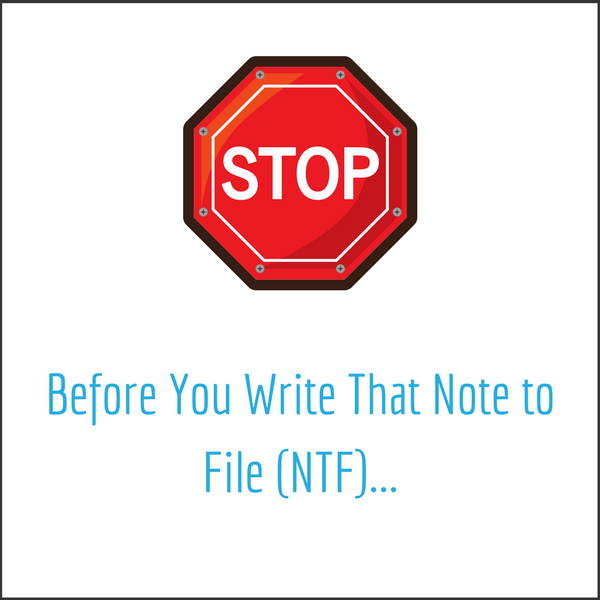 Before you write that Note to File (NTF), read this! This post is unconventional and perhaps a little unpopular, but it has to be said: more than likely, you are writing and filing TOO many NTFs for missing documents, signatures, and data. Enough is enough! Yes, we all know the golden rule of research: if it isn’t written down it didn’t happen. But, there is a limit to what warrants a NTF. If NTFs are used to document every issue, the golden rule can tarnish your research. Anderson goes on to say, “There is nothing in FDA’s regulations or guidance documents that requires sponsors and clinical sites to use NTFs. Nothing.” Not only is there nothing in the FDA regulations or guidance documents regarding NTF requirements but, in fact, misuse of NTFs have resulted in regulatory findings. The citation went on to state that there were an astonishing 89 NTFs generated after a monitoring visit! Another warning letter from the FDA on January, 10, 2011 cited a site for failure to maintain adequate and accurate case histories that they tried to “explain away” in a NTF. NTFs can do one of two things: they can either help you or hurt you in the reconstruction of the conduct of your clinical trial. Perform ongoing QC on your TMF and remediate findings immediately. I am a huge proponent of ongoing QC of the TMF. When QC is performed properly, the QCer is able to identify discrepancies in real time and to remediate these discrepancies in a timely manner (e.g., obtaining a missing signature). Document errors Let’s face it; we’re human and not perfect. Therefore, we definitely will be in situations where mistakes are made. If you document the issue properly, there is no need to panic. Instead of writing a NTF, use the Decisions Log. If you don’t have one; maybe, it’s time to implement one! Understand the regulatory requirements, GCP and protocol before the study starts. Do not wait until it is too late. Perform due diligence. Perhaps you will never be able to collect that Financial Disclosure from the Sub-Investigator who was listed on the Form FDA 1572 and left the site, but are you sure? Did you check all of the files, desk drawers (Yes! There are always documents in someone’s desk drawer. ), and regulatory binders? If so and the document cannot be obtained, do not write one NTF for each missing document. It is also very important to understand that NTFs do not replace the need for the actual document. In my experience, most of the NTFs are to document a missing document. I am not sure how much sense it makes to create a NTF to document that a document will not or cannot be collected…think about that for a minute. If the document is not present it is not present; the NTF does not make it magically appear. Explain the situation and define the problem: Provide a clear and accurate account of why the signature or document is not present. Perform a root cause analysis: Did the Sub-Investigator completely forget to sign just this one document or are there other documents that were not signed as well? Did the sponsor fail to produce the document? Document your due diligence: Did you make an attempt to collect the signature and how? Remember, once that NTF is written, it is part of the TMF. Think twice before you write that NTF, and file it in your TMF.